On October 28, Jair Bolsonaro was elected president of Brazil. The candidate of fascism, supported by the most conservative sectors of society, and capital won 55.3% of the vote while his rival Fernando Haddad won 44.7%. The impact of these elections will be felt not only in Latin America but in every corner of the world, and in every field. 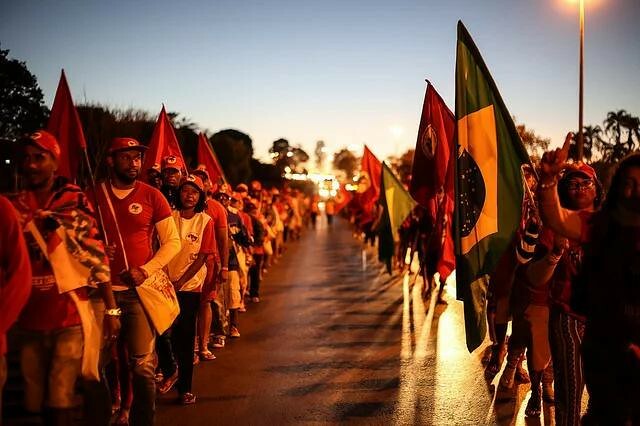 Ahead of this historic election, Peoples Dispatch spoke to Débora Nunes, of the National Board of the Landless Rural Workers’ Movement (MST) about the impact of these elections on left unity in Brazil and what a Bolsonaro presidency would mean for the MST and Brazilian society in general. Peoples Dispatch: How have the last 3 weeks been since the first round? What has the work been on the ground to turn around the vote? Débora Nunes: There were a lot of work, organization and dialogue with the people. After the results of the first round of the elections, we intensified what we have done for more than 30 years, which is going to the towns, neighborhoods, favelas, communities, universities, cities, schools and plazas. We went to where the people are. Both to alert and denounce the neofascist project of the Bolsonaro candidacy, and also to present the candidacy that we defend and we want for Brazil, which is Fernando Haddad as President. We have been using the good material produced by Brasil de Fato, and it is used by the agitation and propaganda brigades in the cities. It has also been crucial to have the enthusiasm of the youth and the experience of the militants and the people who defend democracy and a sovereign Brazil for our people. How has the left unified in the past weeks? How will this unity against fascism continue after the elections? The left had the maturity to understand the threat and the risk that a possible victory of the neofascist candidate Bolsonaro would be. Beyond being the continuity of the Temer government with the regressions and removal of rights that is being imposed on the working class, such a victory risks the national sovereignty of Brazil and the rest of the countries of Latin America. It is this maturity that defended central questions like democracy and the already achieved freedoms, the rights of people, equality for all without discrimination regardless of sexual preference, religion, race, color. Essentially what brought the left together was the certainty that we do not want to live through a new dictatorship, made legitimate by the people. Without a doubt, this unity, recognizing the diversity that we are, is necessary to continue after the second round of elections, because the challenges are big even if Haddad is elected. There is a very conservative congress with a majority representation of the forces of capital in the countryside and the city that will not prioritize the interests and needs of the people. We have a society with a climate of liberalization of a wave of violence, with physical aggressions, assassination and many lies created through social media. So strengthening our unity and a project of society that represents the people is fundamental for the left. In the case of a Bolsonaro presidency, how does the MST that having an impact on the struggle for agrarian reform specifically? The declarations of Bolsonaro with reference to the MST and agrarian reform are of explicit violence and repression. He has openly encouraged the large landowners confront the MST with “bullets” from heavy arms, even gesturing how it should be done. This already makes it clear the unpreparedness and imbalance of the candidate, who does not only encourage the assassination of workers, but also is unaware of what there is in the Brazilian countryside and the role of peasant agriculture, of the settlements of agrarian reform, and of the constitution itself that states that unproductive lands should be allocated for agrarian reform. In the history of Brazil, an important element has been the struggle for land, with the genocides of the indigenous people, of black people and of peasants. A possible election of Bolsonaro would represent a bloody chapter, with encouragement for the persecution and extermination of peasants, indigenous people, quilombolas and their leaders (in Brazilian context, descendants of Afro-Brazilian slaves ran away from the plantations and formed quilombo communities), and the destruction of everything that we advanced in and we conquered with struggle and blood of the landless workers. For example, the right to rural education for those that live in the countryside has already been attacked by Bolsonaro through videos circulating on social media. What is the importance of international solidarity in a moment like this? We learned from the beginning of our movement that while we may be in different regions, we cannot allow our borders to stop us from coordinating and strengthening the working class of the world. This is especially since the reach of capital continues to grow, and it is having a devastating effect on rights, biodiversity and the people themselves everywhere. This is why international solidarity is so important. At different points in our history, when the governments wanted to end the MST and repression was intensified, we were embraced by fraternal organizations across the world. This taught us the value of solidarity, and we have this value as a daily practice.